Law Enforcement Agencies and Task Forces – contact us to save money on attendee travel costs and per diem by bringing our law enforcement training to your city. Contract to pay for a certain number of attendees. Provide the classroom that can hold the number of attendees for the course (varies). Supply audiovisual equipment agreed upon. We will need large dry erase boards as well. Bring coffee for the attendees on mornings we are in the classroom (we provide some breakfast goodies and at least one lunch). Furnish radios and a channel for communication during field training. List and link to our course on your website to help with advertisement. Email and call local agencies to inform of upcoming course and any open spots. In exchange for your time, location, and effort we give you 1-2 comp spots for the course (depending on course and number of attendees). You don’t pay any extra for our travel or per diem. It’s included in our normal tuition per an attendee. *If you are from Alaska, Hawaii, or a foreign country, contact us to see if we can work out coming to your agency. Currently, we are scheduled for training in Hawaii again (in 2018). The other perk of contracting is that it allows an individual agency to request a seminar or course be tailored to their specific needs and to have it presented at their location. 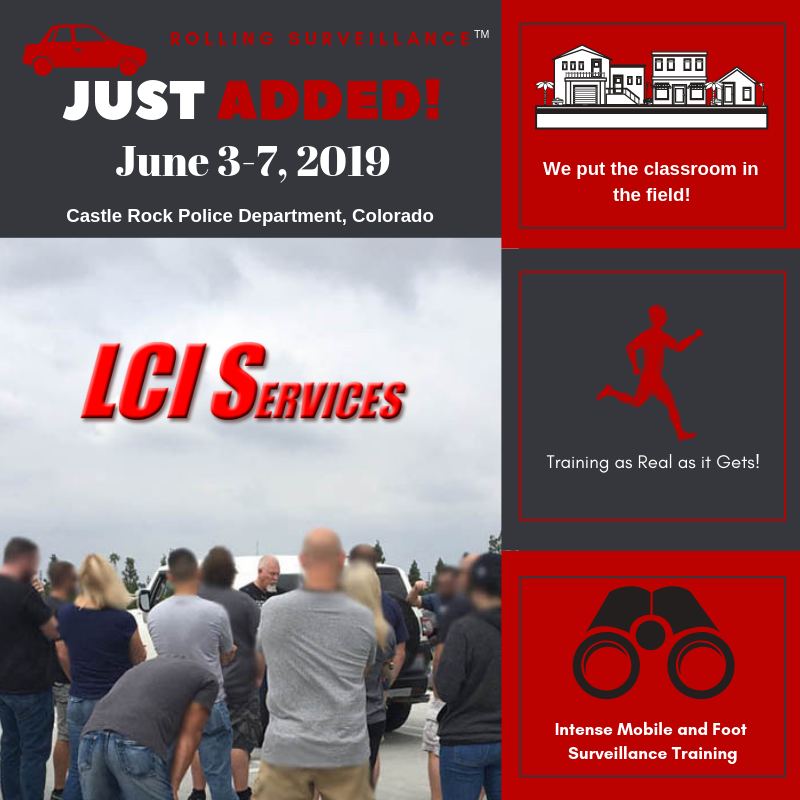 Such as this last year we combined a Rolling Surveillance & Rolling Surveillance II refresher course in Albuquerque for a task force who have previously taken the courses. Host agencies benefit by receiving one or two tuition free placements within the selected training program. Holding it at your location greatly reduces costs associated with travel, lodging, and per diem of individual officers. Host agencies will be expected to assist in the training advertising through emails, flyers, telephone calls and printed materials supplied by LCI Services. In addition, you will be asked to list the class on your agency website with a link back to our training page, provide a training site, audiovisual support, radios, and coffee for the Monday class. Also, if requested, agency provides travel from hotel room to classroom for instructor. A Hosted Course will be held if there is a sufficient number of “guaranteed” students in the course. This is to ensure all expenses will be covered. If enrollment is less than required, then the course may be postponed or canceled. For your support in this effort, we will waive tuition for one or two members of your agency or other individuals you select to attend, if the hosted course is held and depending on numbers. No one other than approved attendees on the roster and LCI Services approved staff will be permitted inside the training room. No photos or recording equipment without prior approval by Tim Lewis of LCI Services. Contact us today to schedule your next training.